Dental hygiene is the preventative approach to oral health that will help you maintain healthy teeth and gums for life. 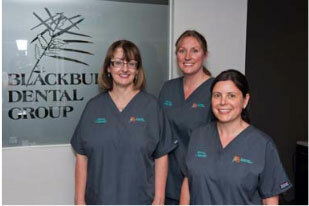 The utilisation of dental hygienists at Blackburn Dental Group provides us with a greater opportunity to help you do this. Dental Hygienists are specially trained members of the dental team who work together with our dentists to provide fully integrated dental care. They play an important role in oral health, by providing individualized preventative treatment and demonstrating correct home care to patients to prevent dental disease and tooth wear. 1. Dental hygiene education tailored to the patient’s needs. This one‐on‐one instruction includes care for your gums and teeth, and information on dietary habits and health conditions which may be adversely affecting your oral health. 2. Collaborate with your dentist to plan an oral health maintenance program, including assessment of your periodontal (gum) health, evaluation of radiographs and review of your medical history. 3. Removal of calculus deposits and stains from teeth. 4. Application of decay preventing agents & recommendation of products for home use. Usually dental hygiene treatment is pain free. If you find treatment uncomfortable it is important to discuss this with your Dental Hygienist. Various techniques are available to help. Dental disease can be prevented. Effective home plaque control techniques help to prevent gum disease and tooth decay. Such problems are then less likely to progress into more serious dental ailments, resulting in extensive and costly dental treatment. The Dental Hygienist has been specially trained to perform preventive treatment and maintenance of the mouth, teeth and gums. Your Dentist will refer you to a Dental Hygienist for more specialised oral care while they provide complex restorative or cosmetic care. Any preventative care will ultimately lead to savings. Depending on the type of treatment carried out and the length of the appointment, costs may vary. It is important to agree to and confirm the cost of the visit before the Dental Hygienist begins treatment.